YouTube Fast Search is a cool web application that uses YouTube's API to create a way to both play videos and search for new videos at the same time. You can build a playlist from search results and add new videos to the playlist without interrupting it. 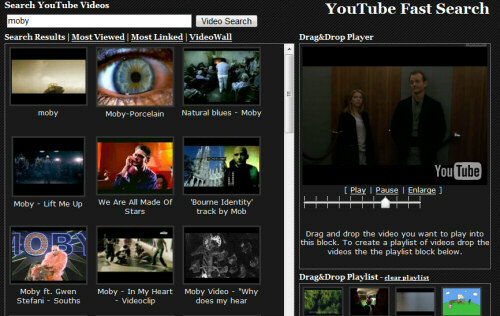 The interface is similar to the one from MSN Video, but you can also edit the playlist and enlarge the video. Too bad that there's no option to save the playlist to your YouTube account or to import an existing playlist. YouTube has the option to add videos from search results to a Quicklist and then play all the videos from the list, but you need to switch from the view mode to the search mode. But I still have some problems with IE, 'cause I'm developing under Linux and so IE-Debugging is pretty difficult. But everything is fine with Firefox. Maybe someone can give me a hint, what is wrong with IE and I can fix my script so that it is accessable as well for IE-Users! after the slash you just write your search term and it creates a continuous TV show with the results, with full screen, always on top tiny window and meta details. Embedr.com calls it a "Smart Playlist" and let's you build it based on keywords, YouTube ID and specifics. There you can listen to music the whole day, of course for free. I want to share my You Tube favorites and playlists with others..How do I do this? Yes looking the same - I want only export ALL of my YT Playlists to one Text List - How can Do This?